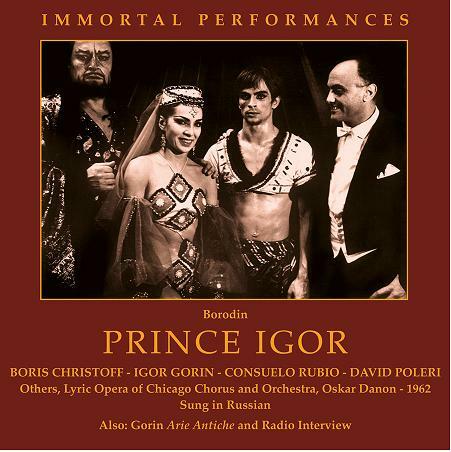 �The principal value of this important release is Gorin�s Igor, a towering achievement vocally and dramatically. His rich, resonant, firmly focused voice is based on an extremely sound technique, and he sings with presence and character. Those who really love this opera should know this performance, which is as richly characterized and beautifully sung as any. In addition to Gorin, this performance boasts Boris Christoff in the dual roles of Galitsky and Konchak . . . In his excellent notes, producer Richard Caniell writes that Christoff is not in quite as firm voice as he was on his earlier EMI BORIS GODUNOV recording. That may be true, but he sounds pretty good to me here, and with much firmer tones than he shows on the later EMI set. 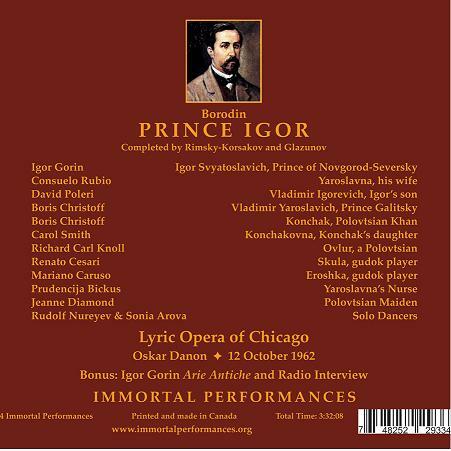 There is one more highlight in PRINCE IGOR, and that is the tenor David Poleri�s sensitive and lovely singing here. This version of Vladimir�s Cavatina can stand with some of the finest. So the monumental presence of Christoff and the rich Prince of Gorin are the reasons for serious collectors to explore this set. That is especially true because of the added bonus of a 1961 studio recording originally on the Golden Crest label called �Arie antiche�, with Gorin accompanied very nicely by pianist Willard Straight. . . . A brief interview rounds out the Gorin material here. "During their shared years with the Bach Aria Group, Eileen Farrell stated to me that her greatest reward was hearing the gorgeous singing of Carol Smith, an outstanding contralto. 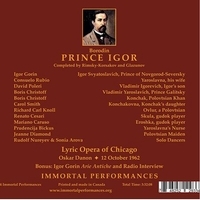 Smith's singing of Konchakovna is another compelling reason to own this important set."